This seemingly innocent question is the first thing my husband is asked when someone learns about our loss history/grief journey. It never fails. Every time he tells me about it my heart aches for him; for his unacknowledged grief. It lingers in the air like an unanswered question, begging to be recognized and responded to. Begging to be validated. Over the years he’s become accustomed to it, I suppose, but I don’t believe the sting ever goes away. The sting that says his feelings and perspective are somehow less than. That he is a bystander to this horrific loss; relegated to the shadows and forgotten. Scott’s grief is just as important as mine; just as profound and life altering. Our loss is a shared experience and while, we have grieved differently over the years, his grief is just as valid and important as my own. People assume (incorrectly) that because I carried our four babies that live in heaven in my body that my grief exponentially outweighs Scott’s. I would agree that I grieved much differently than he did because of my having physically held their tiny lives within me but different doesn’t mean better or worse. It doesn’t mean more or less than. It simply means different. For example, he didn’t grapple with feeling as if his body had failed as I did. That was a nasty layer of guilt reserved for me because I felt it was my job to provide a hospitable environment in which to grow these precious beings we loved so deeply. After each loss the hateful self-talk would ratchet up in my brain and I would feel more and more worthless; more and more of a failure. And while that wasn’t the same for Scott, he grappled with his own feelings of inadequacy. He would tell me it was his job as a husband and father to protect me and the baby; when we lost each of our babies, he would feel as if he had failed me. And the baby. “YOU DIDN’T FAIL!” I would insist any time we discussed it. But as many times as I would say it, as many times that I would contend that he was wrong, it didn’t change how he felt inside. His negative self-talk and feelings of failure were powerful; they colored the lens with which he viewed our losses for a long time, much as mine did, and although similar – it was different. The biggest difference, I would come to learn, is that my feelings were mostly validated by the outside world whereas his weren’t. I was the star of the “grief show” and Scott was looked upon as guest star or background actor. Luckily, our tribe got it – they didn’t make Scott feel as if his grief was non-existent. In fact his best friend, Craig, was designated by our friends and family to check in on us every so often and have the hard conversations that other people just didn’t want to have with us. It was Craig’s job to come over to our sad house, with the still-intact nursery, and give us the space to bare our souls. I’m chatty by nature. I had no problem telling Craig exactly where I was at and put language to my dark head space. As a woman, talking about my feelings and perceptions comes easily to me, even more so when anyone I ever spoke to about it endorsed my words. It would have been easy if he had just let me do all the talking but as Scott’s best friend of over twenty years, Craig knew better than to let Scott simmer quietly. One word answers, surface level conversations, and changes of subjects were off limits in those days – Craig pushed Scott to open up about his grief, about our marriage, about everything. I had never seen my husband so open, so willing to let someone into his brokenness in real time before – and I haven’t seen it since. Scott wore a mask in those days because after a while of your grief going unacknowledged, it’s easier to pretend your fine and stay in your lane as the supporting actor so that the “star” of the grief show, aka me, would be cared for. Craig saw through that mask in seconds- he wanted nothing to do with that mask and poked and prodded my husband until he got what he was looking for: truth. The raw, messy, brokenness of grief that was coursing through Scott’s veins but wasn’t being validated by people in his every day life. Craig’s validation was a catalyst for Scott to become more willing to put his true self out in the world and to begin standing up for himself and other grieving fathers who were facing a similar lack of acknowledgement. 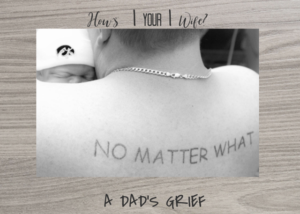 I’m unbelievably proud of the work my husband does with grieving dads. I’m proud to hear him share his grief and bear his beautiful scars with men authentically and encourage their grief process and healing. I’m beyond thankful for Craig, specifically, for seeing past the mask and having the courage to keep pushing Scott to not only face his grief, but to have the courage to talk about it in real time, in real and raw language. Craig’s willingness to sit in the mess with us, have the wisdom to support us both in our unique grief, and the courage to keep showing up for Scott when he wanted nothing more than to isolate, shaped our grief journey indelibly. My wish for all grief warriors, especially our grieving dads, is that they have a friend like Craig who shows up, even when they’re pushed away. 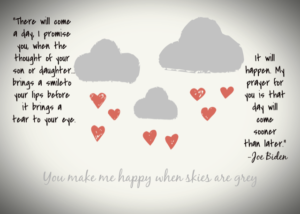 Even in the darkest days. Even when there is nothing they can do to “fix it” or take the pain away. My wish for all grieving families is for a friend to come along side of them, be tender enough to allow them to remove their mask, and to allow them the space to freely express their grief with full acknowledgement and validation. “How’s your wife?” is not the way these conversations should go – Dad’s are more than the supporting actor. And because of the brave Grief Warrior Dads like my husband, they no longer have to grieve silently or wear a mask. This loss happened to him, too. His life and heart have been shattered, too. A Dad grieves, too.